This version of the Sinn 556 I Series features a dark blue electroplated dial with sunburst decoration. Sinn calls this new watch their sporty, elegant watch. This version of the watch is fitted with the Sinn fine link bracelet, one of the most comfortable on the market as it literally molds to your wrist. The new Sinn 556 I B features a case size at 38.5 mm which is satinized. This finish results in a slightly more polished look without the shiny "mirror look". In addition, the dial features hour indices for a very clean layout. This watch is fitted with a Sinn stainless steel fine link bracelet with locking clasp and ships with a free set of Sinn bracelet sizing tools. Verified Owner Comments: This is a great watch. Great looking, great size, comfortable to wear and extremely accurate (thus far) at +1 second/day....thats better than any of my COSC certified watches have been able to achieve (with exception of Brietling Aerospace and Tissot PR100 Quartz Chronometer, both with HAQ movements). Really impressive. If I had to make a couple suggestions to Sinn it would be !. to engineer and offer a micro adjustable clasp. 2. make sure all distributors are aware not only what their territory is, but who their fellow distributors are so a customer can be guided correctly and directly if they happen to live in a part of the world where their nearest distributor is not in fact their distributor. But in regard to the watch itself, could not be more pleased! Verified Owner Comments: This watch has to be seen on-wrist to be fully appreciated. The rich blue dial is very understated until viewed in full sunlight where it truly reveals its glory. The applied indices give this model a true sense of luxury over the printed dials of the 556 A and 556 I black dial. The fine link bracelet is one of extreme quality with an excellent double deployant clasp that has no equal. It is also thinner and quieter than Sinn’s H-link bracelet albeit a trifle less comfortable. This watch would make a great 1 watch collection. Verified Owner Comments: Perfect one-watch. Slim yet sturdy. Rugged and sporty yet perfectly acceptable in dressy occasions at the same time. No date means no fuss. Strap monster. This is one beautiful watch. I bought it for a graduation gift for my son but wish I bought this for myself over my IWC Mark XVIII Le Petit Prince. 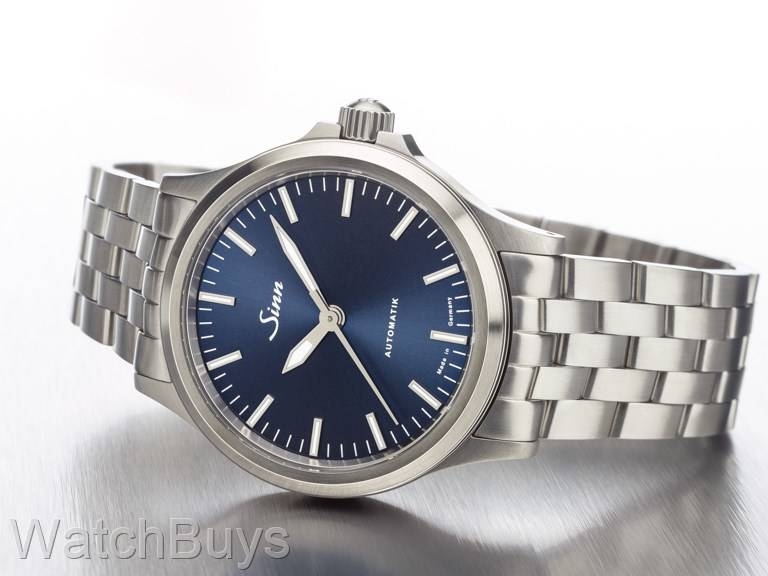 By the way, the georgeous blue dial on this Sinn watch leans more toward a purplish-blue than my IWC’s medium-blue dial, but is equally beautiful. Verified Owner Comments: Pictures don't do this watch justice. It has to be seen in person. Sinn did a great job with this one. Hope to see more variations in this configuration, without the date and with the applied hour markers. Verified Owner Comments: I own both of the older A and B dial models and have enjoyed them. But this version really blows them away and takes the series to the next level. The fine link bracelet is definitely an upgrade from the H type and the watch as a whole wears very comfortably. The sunburst dial is gorgeous as is the color. Case finish is very nice indeed. What I really love though is the way the light plays off of the indices and hands, which totally livens up this piece compared to the older all white scheme. 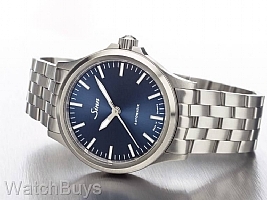 If you were only going to get one Sinn and didn't want to go the larger diver route I would say this as good as any model they have put out so far and that is saying a lot! Verified Owner Comments: I recently purchased a 556IB w/ fine link and I must that I couldn't be more pleased. I set it to Atomic Time and if it's lost time I can't see it. I have had numerous nice comments. The service from Watch Buys has been spot on and I will definitely use them again. Verified Owner Comments: I've been looking at Sinn watches for a few years but, for whatever reason, didn't purchase one until the 556i B came out. The simplicity without the date complication, the clear indices and that fantastic blue face. Photos don't do it any justice! WatchBuys was fantastic throughout the purchase process and I couldn't be happier with the experience and look forward to doing business with them again.